For young, aspiring dancers and also for professional dancers, dance class is a place where the focus is on honing in on technique or warming up for a day of rehearsals. For adults and “non-dancers”, however, dance class becomes an artistic, freeing, fun alternative to a gym workout. So how do teachers approach teaching adult students and make dance accessible and enjoyable for all? Here, Dance Informa speaks with some teachers who welcome “non-dancing” adults in class and show them that they, too, can actually feel like dancers. Wildish has 38 years of experience teaching dance to all levels and ages, with students ranging from three to 102 years old. Now, she mainly teaches adults and has quite a following. In her open ballet classes at the Ailey Extension, Wildish sees students of varying professions – bankers, doctors, lawyers, editors, therapists, architects, secretaries – many of whom attend classes a few times a week. She says she takes each student seriously, regardless of technical ability or age, but also sprinkles her classes with humor. Abi Hammond, who teaches adult ballet classes at Connecticut Ballet Center, says she tries to really challenge her students but also strives to incorporate the joy of dance. For adults, dance class, with its elements of music and being a part of something creative and expressive, becomes an enjoyable way to get a good workout. Since it is often their workout, teachers need to be attuned to the adult body and how it differs from young dance students and professionals. Wildish says that one of the challenges of teaching adults is the “book of excuses” they sometimes bring into the studio. “Sometimes the entire class is a ‘hospital’ class – vertigo, sore ankle from shopping, stiff shoulder from lifting grandkids – but a good workout seems to make things better for all, and I love them for coming,” Wildish says. 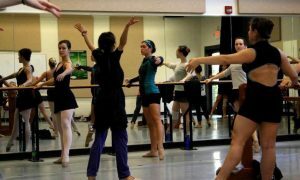 Melissa Weber, a dancer with the Charleston Ballet Theatre (CBT) and a faculty member at the CBT Dance Education Center, says she enjoys teaching adults because they tend to be “easy-going and behave better” than children. 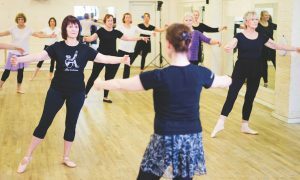 Most of the adults who take recreational dance classes have no aspirations of a performance career, and class is often their only performance venue. Wildish, however, has been working to change that. Since 2000, she has offered performance opportunities to her adult students, allowing them to learn and perform excerpts from classical ballets. Through these performance workshops, she has also paved the way for other teachers to allow their adult students to perform nearly every style of dance. These performances are held three times a year, complete with costumes and lights and often to sold-out audiences, at the Ailey Citigroup Theater in NYC. Wildish says she wants her adult students to experience “the lights, the makeup, the costumes, video, photos, stage crew, technical rehearsal, the grind, the excitement, the exhaustion, the thrills, the rewards”, just like any professional dancer. All of these teachers encourage any adult who has an inclination to try a dance class to just go for it. For those interested in participating in Wildish’s upcoming fall Performing in NY Experience Intensive, from October 15 to November 21, visit: http://clients.mindbodyonline.com/ws.asp?studioid=851&stype=41&prodid=1161. Top photo: Kat Wildish leading her open ballet class, often frequented by adults and “non-dancers”, at the Alvin Ailey Extension Photo by Arthur Coopchik.